At Brilliance, halo diamond engagement rings have been our most popular and best selling settings this year. Halo, which means a ring or a crown, is an engagement ring style in which diamonds or gems encircle a center loose diamond. Many attribute the halo shape or design to infinite and everlasting love. 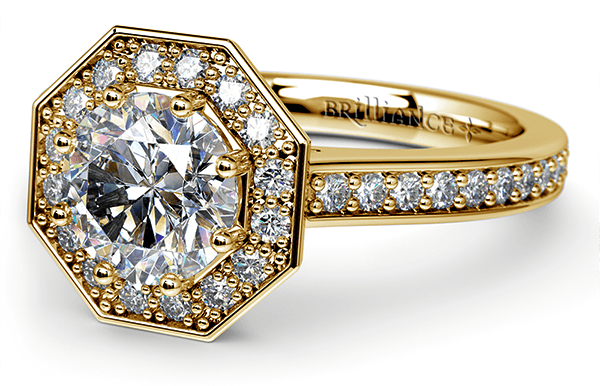 Halo engagement rings come in many varieties. A popular type of halo setting is where the center stone prongs are raised slightly above the encircled diamonds, which has a more prominent association. Another variation is the bezel-style halo ring setting, where there is no gap between the encrusted diamonds and the center stone. The bezel halo diamond ring is also very popular and elegant. What draws customers to the halo diamond setting is that it accents your center stone of choice making it appear larger and adds an overall sparkle and fire to the ring. In today’s economy, not many can afford large loose diamonds but with the halo setting you can own a ring that adds the appearance of a large loose diamond without paying thousands of dollars for a larger stone. Another advantage of halo engagement rings is that the diamond’s pavilion, bottom part of the diamond that bridges the girdle to the culet, is visible when viewed from the side. The pavilion is essential to the light performance of the diamond. Brilliance carries a variety of halo set engagement rings in all types of metals to fit every budget. In addition, we can create any number of settings that feature diamonds or gemstones surrounding the center stone. Round and square are the most popular halo shapes encircling center diamonds, however we can create a Halo engagement ring with any diamond shape. Lastly we can create custom halo engagement rings for those who desire a ring that isn’t found on our website.